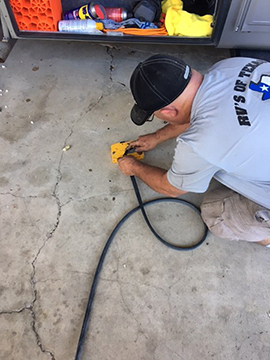 The owner and lead technician, Ron Baker has built multiple major service departments in North and South Texas, taking them to the next level with national recognition. One of our strong points is choosing the right people for the job and teaching our techs how to do the jobs right and in a timely manner. Our everyday goal has been to make repeat customers, into customers for life. As a team we work hard and do the very best to have great ideas to accomplish our customers dreams & visions, and on a timely basis. Occasionally I have had the pleasure of camping and RV'ing which has help me understand what a customer is going through during a service issue. We don't just replace a fuse that's blown, we find out why it blew so you won't be stopped again down the road. It is this integrity we use daily to make the best use of your time during repairs. The biggest challenge we have is being able to get to all our customers as fast as possible. It seems we need more service vehicles. We know what growing pains are and work hard to meet the demand. Contact Ron & his team for your RV Service needs. Need a specialty job ... contact Ron & his team today! 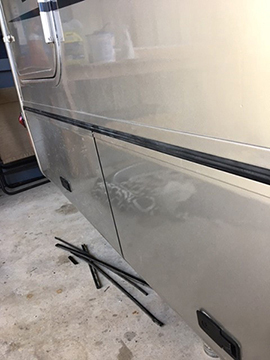 RVs of Texas Service, continuously sees the damage caused by your neglecting RV roof repair and maintenance on a daily basis. Many factors can take a toll on your RV’s roof, from extended use to severe weather. If your RV’s roof has a crack, it could cause a leak that not only ruins your belongings but makes for a very uncomfortable environment for you and your family. Let the experts at RVs of Texas Service provide RV roof repair services for you today, from replacing your entire roof to fixing any RV roof leaks. RVs of Texas Mobile Service offers expert RV appliance repair & installation services. We can't imagine anything worse than an appliance in your RV or travel trailer breaking down while you’re out on the road enjoying the Texas Hill Country & the beautiful USA. Our knowledgeable technicians are able to provide fast and reliable RV appliance repair & installation for a variety of issues, from a broken Dometic/Norcold RV refrigerator to a malfunctioning Atwood/Suburban RV water heater, Dometic/Coleman Roof Top Air Conditioner and much more. Contact RVs of Texas Service for Appliance Repair, Maintenance and Replacement. Mobile RV Appliance Repair & Installation Services Available in the Texas Hill Country including San Antonio, New Braunfels, Seguin, San Marcos & South Austin. Please contact us to see if we service your area. Mobile RV Service - Appliance Maintenance is available from RVs of Texas Mobile Service. Don't risk off on a vacation in your RV-travel trailer or Motorhome, only to have an important RV appliance like your refrigerator, water heater or air-conditioner break down! Our RV maintenance services will help ensure your RV appliances are working properly not only during your vacation, but for many more years to come. Investing in RV appliance maintenance can help extend the life of your appliances, often saving you countless dollars in the long run. Your RV has seen trips in every season and years of family fun. But so has the carpet in your RV. It's time to change the worn-down carpet to give your home on wheels a fresh look. RVs of Texas Service is here to help providing professional, certified and bonded technicians. Contact us for a free estimate of RVs of Texas Services today. RVs of Texas Service has years of RV experience from a campers perspective and as a mobile service provider. Our service includes Holding Tank Service for Black and Grey Tanks exercising environment hazmat friendly. Ask our mobile RV competitors before you call them. RVs of Texas does it RIGHT! Never leave your black tank valve open at a campground or anywhere else. Your black water tank will not drain directly into the septic system and will create buildup. Over-time oil and residue builds up in the gray tank causing a foul odor. The buildup also affects the valve and tank assembly. Annual high pressure flushing by RVs of Texas Service will end this problem for you. Carry an extra garden hose to use for rinsing in case the dump station doesn't have one. Store this in an area where it won't come into contact with your drinking water hose. 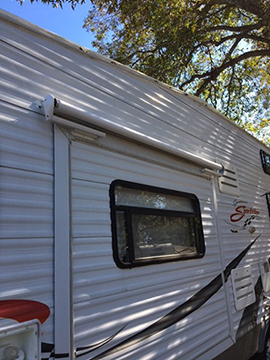 RV awnings provide shade for you, your family, and pets. They’re the perfect spot to relax under, share a meal, play a game, or just enjoy the beauty of the outdoors. Let RVs of Texas Mobile Service provide installation, repair and upgrade services for RV your awning today. 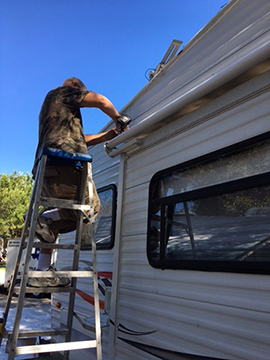 Mobile RV Awning Repair & Installation Services are available from RVs of Texas Mobile Service. Contact RVs of Texas for any service need which might not be listed. RVs of Texas can help you with your insurance and warrannty claims. We accept most RV Warranty companies. RVs of Texas Service includes maintenace services to extend the use of your Recreational Vehicle / Trailer for years to come. Current List of Services. Get the details!